Scroll through the gallery to view photos from this event. This past week I was invited to attend a dinner party at the home of celebrity chef Kent Rathbun. Who can say no to the chance to peek inside the life of one of Dallas’ most popular culinary figures? Not me! 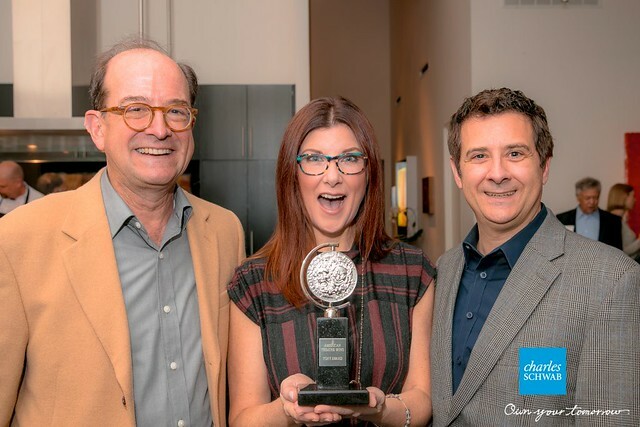 The evening was hosted by Charles Schwab in celebration of the Dallas Theater Center’s upcoming 2018/19 season. It may have been cold and rainy outside, but inside the Rathbun home, things were sizzling hot and spicy! Charles Schwab prides themselves for taking care of their clients and supporting their communities and this evening was a great example of them combining both missions. David Russakov, a Schwab financial consultant and DTC Board of Trustee member, welcomed guests and introduced Kevin Moriarty, DTC’s Artistic Director who explained that Rathbun had been challenged to prepare a menu for the 50 or so guests inspired by the new DTC Season. Here’s how Rathbun interpreted things: The evening started with passed hors d'oeuvres. In honor of Steel Magnolias hitting the stage September 28, Rathbun created a Fried Green Tomato with goat cheese cream. That softball was kind of expected. The next play he had to contend with was Real Women Have Curves debuting June 28, a humorous and warm hearted look at a Mexican-American teenage girl coming of age in a boiling cauldron of cultural expectations, class constrictions, family duty, and her own personal aspirations. Rathbun’s ode to this play was a Fajita Steak Nacho with black beans and pico de gallo. Again, kind of obvious but also super delicious. DTC’s Christmas Carol was next up. This annual holiday performance is always a crowd pleaser, as was Rathbun’s Mushroom Wellington. The entrees courses are where Rathbun really showed his creative expertise. Small plates were created for four performances in a tapas-style dining experience. Fetch Clay, Make Man, debuting December 5, explores an extraordinary friendship between Muhammad Ali and the actor Stepin Fetchit. Loosely inspired by an actual friendship between the two men, the play explores how each dealt with the pressure of being a black public figure trying to shape his identity in the face of outside forces. Rathbun’s course was Lemon Pepper Roasted Chicken with crispy Mac & Cheese and a roasted mushroom pan gravy. Debuting February 8, Sweat, revolves around working class workers in Reading, Pennsylvania so a Wagyu Philly Slider with basil cream cheese, caramelized onions and peppers was fitting. A Mustard Crusted Rack of Lamb with pimento roasted cauliflower celebrated a play that centers on the experiences of high school girls through their daily afternoon soccer warmups called The Wolves, debuting March 6. Shakespeare’s Twelfth Night, debuting March 29 is a star-crossed, cross-dressing melodic tryst and Rathbun cheekily created a soft, scrambled egg with osetra caviar, king crab and chive butter. Loved it! Lastly, the dessert course honored Penny Candy, a new play from Dallas playwright, Jonathan Norton, set in Dallas’ Pleasant Grove. This play follows one family as they seek to balance their own responsibilities to their community and one another. Rathbun’s sweet treat was a chocolate Pot de Crème with warm caramel, orange whipped cream and a dash of sea salt. Is your mouth watering and your brain tantalized? The DTC recently received a 2017 Regional Theatre Tony Award. One of the most prestigious and coveted honors in the entertainment industry, the Regional Theatre Tony Award is presented each year to honor a non-profit professional regional theatre company in the United States that has displayed a continuous level of artistic achievement contributing to the growth of theatre nationally. It is awarded based upon a recommendation by the American Theatre Critics Association. Party guests delighted in holding the award. Many taking selfies with it – you know I led that charge! As an Arts lover, I encourage you to experience the magic of live stage theater and take in one of the DTC’s plays in this upcoming season. I can also appreciate the vision of Charles Schwab in recognizing that “wealth” comes in many forms. There’s obviously financial wealth, but it’s also nice to see a huge financial institution also place value on wealth of experiences, friendship, community involvement, etc. This post was brought to you by Charles Schwab. While I did receive compensation for authoring this post, descriptions and opinions are 100% my own.